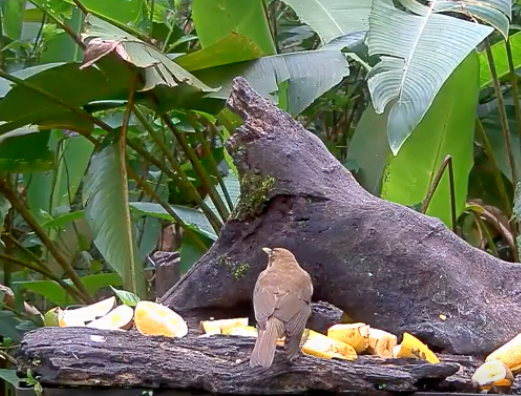 The Panama Fruit Feeder Cam is located on the grounds of the Canopy Lodge in El Valle de Antón, Panama. This site is just over 2,000 ft above sea level in the low mountains of Cerro Gaital, with a mild springtime climate year-round. A small stream called Rio Guayabo runs past the feeders in the background, and the lush landscaping of the Canopy Lodge grounds grade into the forested slopes around them. The feeding table is around 40 feet from the main lodge, and is one of several feeders provisioned throughout the day so that guests to the lodge are greeted to spectacular views of many of the common birds found in this ecosystem.